I’ve got to be honest with you. We weren’t alone. Boudreau was speaking from the head table to about a hundred of us at the monthly TEG breakfast. I just wanted you to think that Coach and I were buds! Bruce Boudreau, the winningest coach in the NHL today, voted NHL “Coach of the Year” in 2008 and 2009 – and likely to repeat this year: “Passion. Perseverance. Shoot for the top.” Simple, straightforward advice; not necessarily easy. 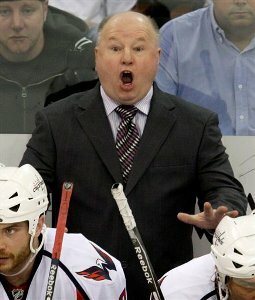 Coach Boudreau is a simple man and a very funny guy to boot. He told us about the time, three-and-a-half years a ago, when he got the call that he was selected to be the next Capitals coach. “Can you imagine what I looked like? This short, fat, bald guy jumping up and down on the bed yelling to my wife, ‘I got it, I got it! '” He shared many more anecdotes that morning, some of which shouldn’t go public. But send me an e-mail and I’ll reply with the rest of the story. It is never just money that turns people on in a sustainable way. With that critical element of passion firmly implanted in the hearts of your team, the rest of the job you are up to will be so much easier, fun, and exciting – for you, your employees, customers, investors, and suppliers too. Do you have it? Passion? Think about it. Does this stir up an insight within you? A yearning to find that passion? If so, what are you going to do about it? What will you do and by when will you do it? Insights and good ideas are fascinating. But action is the only thing that will slam that puck into the net. I would like to hear from you. It helps to tell someone what you intend to do. Leave your comment here – or send me a private e-mail if you want to keep this just between us kids. Lowell, I really wanted to be at that breakfast and I’m so grateful that you’ve shared some of what you learned from attending. This is a great article! Steve, sorry you missed it. I’ll send you the rest of what i recall via email. Spot on, Lowell. It’s so easy to get caught up in the minutiae of just getting your job done. All too often, we forget why we decided to do what we do (could it be because we once loved it?). And, more importantly, how do we use our expertise and influence to help others? Well done. Passion without purpose is sizzle without the steak.